Here are some self proven ways that I have utilized and managed to get more time in my 24 hour day. I have seen info-graphics and a lot of other information about how much sleep successful people get. Most of them, from Martha Stewart who sleeps for 4 hours, US President Barrack Obama for 6 hours, and Ellen DeGeneres for 8 hours. This shows there is no gospel truth about how many hours one should sleep, but listening to your body. Another thing these people consider is at what point are you most productive? Are you a night owl or an early bird? Barack Obama sleeps at 1 am and wakes up at 7 a.m because he is a night owl, he is more productive at night, probably when everyone has gone to sleep. Marrisa Mayer, the CEO of Yahoo is usually up and running by 4 am. However, you must notice that none of these people sleep for 12 hours. No one goes to bed at 8 and wakes up at 8. When you are hungry to get something done, you will stay up late or wake up early and get it done. Listen to your body, and then obey your alarm clock. I know how this sounds. You are done with work, endure terrible traffic hours and get home exhausted, it is time to kick your heels and relax. Not really, if you get to this routine, you will never get anything done. The time after your day job can be used to develop a project, learn a new skill, and create time you didn’t think you had. All my studies I have done them in the evening, after work, I go to classes for 3 hours. Jack Ma, the founder of Alibaba, says this period, between the time you leave work and the time you sleep could change your life. If you create time between 9 p.m. to midnight, those are 3 hours in a day, 15 hours in a week. That is good time for you to get something done or learn something new. Still on the work after work hours issue, how much time do you spend watching TV? TV can be very addictive, more so because material is being presented to you without making any effort, you find you are watching everything that comes across your screen. I always tell people that I don’t watch TV, and do not own one, I have not subscribed to any cable TV. I do not feel as if I am missing out on anything. I choose what to watch, on a weekend whereby I play a movie and enjoy it. This is because I have made the choice to watch the movie, and therefore with discipline. A movie is 2 hours max, after that I can work on something constructive. 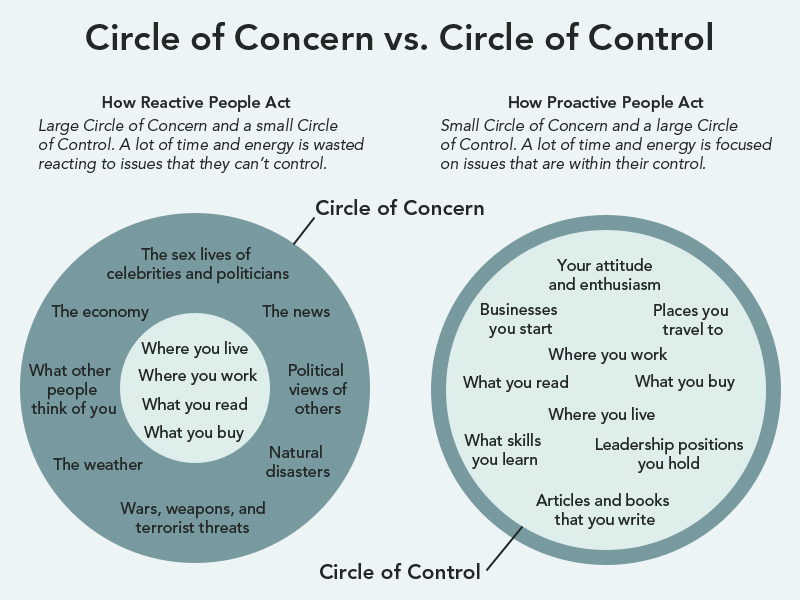 A lot of TV time increases your circle of concern, which turns your life into a reactive one instead of a proactive one. You spend your energy on things that are not within your control. What control do you have over top celebrities divorce? Or war between countries? I am not saying that you should be ignorant about what is happening around you, but you can choose what is important and relevant to you. What happens when your TV connection is not working? You feel bored, right? Yes, that is idle time right there that you could utilize positively. Social media, just like TV, will provide you with a lot of information. You will never log in and lack something interesting to keep you hooked. In this era of social media, we use it for information, marketing, branding and to connect, which is ok. However, how much time should you spend on social media? If your phone keeps on buzzing when notifications get in, you cannot resist from checking. To keep check on your social media usage, you can slot in time within your schedule to check into social media. During this time you are concentrating on something else, you can switch off data packages, and WiFi, so that notifications do not distract you. My schedule on social media is something like this: I check social media in the morning to see what’s new, and to post my morning content. When I take a break from work at around 10. A.M., I check what’s happening. I will do the same at around lunch time and in the evening after work hours. If you commute in public transport, you can also update your social media during your commute. Make a schedule such that it is you that control your social media usage, not the device that controls you. Networking is good, as well as socializing with friends and family. The question is, how much of it is too much? If you grab a coffee or a drink every day after work with friends, then that is too much. Another question is, how much of this social life is beneficial to your life? Is it about catching up with office gossip? Or complain about life? As an introvert, I am probably not the best person to advise people on social life, since I keep mine at a minimal. However, I can say that choose when to socialize, and with who. Go out with people who build you, add to your pool of ideas or that you help build. I was mentoring someone about this topic of time; he complained there was no enough time for him to work on a project he had been working on. I asked the mentee what he did in the evening. In addition to watching TV, he said he did some “catching up with his neighbor”, every day. I don’t think you will catch up with someone who is not your spouse, everyday, and talk about something constructive. I thought this is a waste of time, since you will find after some time, you run out of things to talk about, and you will get involved with gossip, politics, and a lot of other things in the circle of concern that do not build you. How much of your time do you spend on work that you would have otherwise delegated? I learned to ask for help on things like laundry, housework, and little things that waste your time, while you could spend this time working on something else. Most people say they cannot afford to pay for help. Let me put it this way, if you spare that time, and use it on your project, will it make you some money? Yes! in the long run. Is the money you make more than what you pay for help? Yes! This may not be easy when you are starting and you are bootstrapped, but if you can afford to, get some help, focus your energy on stuff that will pay in the long run. In his excellent book Today Matters, John Maxwell insists on the art of saying no, and how it can make your day a masterpiece. Do you always say Yes when people ask for your help, or favours? You can learn how to choose what to say Yes to and what to say No to. Is it going to benefit you? Can it be done by someone else? Is it going to affect your relationship with this person? You can learn to say no, in a pleasant way. Recently, a friend asked me to help him with his Master’s thesis, with which he had been stuck for months. I am good at research and I had no problem with this. However, my schedule was tight and he was giving me a timeline to work with. I therefore offered not to take him step to step with the corrections, but to read the project, and make corrections and suggestions. On data analysis and interpretation, I asked him to get help elsewhere since as much as I can do it, it is not my strong area and I would struggle with it. You can say no in a pleasant way, explain yourself and offer alternatives. Most of us glorify the work busy. It shows we are working hard and we are in the right track. Busy however, does not exactly mean we are being productive. I am sure you have heard the phrase work smart, not hard. Smart work makes you focus your energy on the constructive areas that will give results, as opposed to slaving on unyielding areas. Depending on where you live, the traffic can be a hassle during rush hours. It can be time wasting, ruin your mood and make you unproductive. Living in Nairobi, the heavy rush hour traffic frustrated me until I found a way around it. I found that it is better to get to work early in the morning before traffic forms. This saves me a lot of hours in traffic, and I start my day bright and early. I usually have a very productive day when I start this early. In the evening, I either the office before rush hour, or much after, but not during the peak hours. This has saved me a lot of hours in the past years, that I have focused in projects that have borne fruits, try it too. You can create more an extra hour in your 24hours day using some of the tips that I have given. Use your time wisely, and go the extra mile. There is a quote by Buddha, “The Problem is, you Think you have Time” well, you don’t. You have to create it.